Just a few years ago, all indications were that the battlefield at Franklin, TN was a paved-over, built-up goner. Now it’s a battlefield park that keeps getting bigger and bigger. These folks can make miracles happen. Right now they’re trying to make a few more. Let’s help them out. Civil War News has more info. Let’s cast a Lincoln movie! When I was in high school my friend Dustin and I were devout readers of a magazine called Wizard, which was devoted to the comic book industry. One of the regular features was “Casting Call,” where the editors would take some unfilmed comic book property and come up with their own dream cast for a hypothetical movie based on it. Bear in mind that this was back in the nineties, before the wave of superhero flicks that followed the success of Spider-Man. These little two-page daydreams were about all we had to go on, unless you counted Joel Schumacher’s miserable Batman sequels. (And we didn’t.) Besides, they were just plan fun. You could see how the magazine’s picks stacked up with your own and compare notes with other people. So let’s have a little fun of our own. Since Spielberg’s long-delayed Team of Rivals adaptation is on the back-burner, I say we take a page from Wizard and cast our own darn Lincoln movie. Take that, Hollywood. Of course, the first big hurdle to making a Lincoln movie is finding somebody to play Lincoln himself. His face is both distinctive and widely recognizable. His image is so familiar that audiences wouldn’t buy anybody who didn’t bear a close resemblance. Anthony Hopkins was convincing enough in Nixon without looking the part, but that approach won’t work for the guy on the $5 bill. Liam Neeson was Spielberg’s pick. I can see that working; he’s tall, he’s got the proper facial architecture, and he’s a fine actor. My only concern is that Neeson might be a little too “polished” to play Lincoln. This is a guy who pronounced “chairman” as “cheerman,” and read while lying prone on the floor. Sam Shepard might not be a bad alternate. He has some Lincolnesque facial features, he can speak with a natural twang, and his voice moves up into those higher registers remembered by people who heard Lincoln speak. He’s old for the part, but he doesn’t really look any more aged than Lincoln did by late ’64. Sam Waterston has an established reputation as Lincoln, but I’d rather see him as William H. Seward. Their profiles are pretty similar. I think Bernard Hill, who played the doctor in The Ghost and the Darkness and the captain in Titanic, bears a resemblance to Gideon Welles. Or is it just the white beard he wears in all his movies that’s throwing me off? Spielberg supposedly wanted Sally Field to play Mary Todd Lincoln, but I never could see that working. She’s too cute and perky to be Mary. My first choice would be Mare Winningham. They favor each other a little in the face, although Lord knows Mare Winningham is a lot more attractive. Plus, she’s had practice playing a neurotic wife in Wyatt Earp. Russell Crowe would make a killer Grant. He’s got that steely gaze and determined set of the jaw. Put Jon Voight in a fat suit, and you’ve got your Winfield Scott. I’ve been wracking my brain trying to think of a good McClellan, but so far I haven’t come up with anybody. If you wanted do a young Lincoln movie instead of a Civil War era one, I think Casey Affleck could pull it off, maybe with Bryce Dallas Howard as Ann Rutledge. That’s what I’ve come up with so far. Now it’s your turn to critique my picks and chime in with your own suggestions. Then all we have to do is scrape together some cash, find a director, and watch all the studio execs come begging. Fame and fortune await. While visiting a link for another news story I ran across a pair of letters to the editor of Fredericksburg’s paper regarding the continuing Wilderness Walmart debate. Walmart—champion of the little guy and bastion of local interests. She also complained that congested traffic makes it hard for her to get out and shop, as if a new superstore isn’t going to add to that problem rather than alleviate it. Madam, you’ve just been served. This argument (if you want to dignify it by calling it an argument) pops up with distressing frequency in anti-preservation rhetoric. Some developer comes along and builds near historic ground, despite protests from preservationists. Then later developers and their short-sighted supporters use the blight that’s already there as an excuse to build more, more, more. It’s like telling somebody that they might as well take up smoking because they’ve already got respiratory problems. If the writer is so concerned about outsiders meddling in community affairs, then she needs to take a look at the research that’s been conducted into the impact of chain stores on local businesses and payrolls. Then she can ask herself if she’s really on the right side of this one. I’m reading Stephen Brumwell’s excellent Redcoats: The British Soldier and War in the Americas, 1755-1763. One of his chapters deals with the unique challenges of campaigning in the New World: rugged terrain, severe weather…and insects. Lots and lots of insects. I usually don’t think much about insects when I read military history, but to a lot of eighteenth-century British soldiers who crossed the Atlantic, they were an inescapable and ubiquitous fact of life. This is the sort of thing that wouldn’t occur to you unless you read accounts from people who were there and experienced it. One of the strengths of Brumwell’s book is his intensive research in first-person accounts, and in fact it’s surprising to see how abundant and rich the primary material from these soldiers is. This outstanding use of primary sources reminded me of another fine book I read several years ago called City Behind a Fence: Oak Ridge, Tennessee, 1942-1946, by Charles W. Johnson and Charles O. Jackson. Oak Ridge was a town that sprang up out of nowhere, built solely as a home for the effort to create the radioactive material used in the first atomic weapons. Because the city was built so quickly, there was a lot of mud everywhere, a fact that early residents remembered in great detail. Again, this was an aspect of the historical experience that probably would have gone unnoticed if it weren’t for the fact that it was so prominent in the reminiscences of early residents, so the authors gave it the emphasis it deserved. This is one of the reasons it’s important to be receptive to primary sources. By “being receptive” I don’t just mean consulting them; I mean listening to them as well as asking questions of them. We can get so caught up in framing our questions properly that we miss the things they’re telling us that we don’t even think to ask. These two otherwise unrelated books are both well worth reading, partly because of the questions the authors asked but also because they remembered to listen. Last time I argued that in his book George Washington’s Sacred Fire, Peter Lillback occasionally sees meanings in Washington’s writings that aren’t there. In other words, he commits a fallacy that scholars of the Bible call eisegesis—reading meanings into a text, rather than extracting the original meaning out of it. He finds allusions to Scripture where I think Washington didn’t necessarily intend to make them. Washington did quote or reference Scripture with some frequency, of course, as Lillback correctly points out. And he also correctly points out that his favorite allusion was to the image of the “vine and fig tree.” In the Old Testament this phrase connotes peace, comfort, and safety. In 1 Kings 4:25, it’s part of the description of Israel’s prosperity in the days of Solomon’s reign: “And Judah and Israel dwelt safely, every man under his vine and under his fig tree, from Dan even to Beersheba, all the days of Solomon.” It’s also in 2 Kings 18 and Isaiah 36, when the Assyrians besieging Jerusalem try to convince the inhabitants to surrender, “and then eat ye every man of his own vine, and every one of his fig tree,” until the time comes for their deportation. Micah 4:4 was, according to Lillback, Washington’s favorite verse, and it’s hard to argue with him. Here’s just a small sample of Washingtonian references to this passage. There are a couple dozen more, but you get the idea. Now, what I find interesting about this is the fact that Washington’s use of the “vine and fig tree” motif is quite radically different from Micah’s. Micah used it to describe a time in the “last days” when God would set things right, when Jerusalem would be restored to its rightful place and the nations’ proper relationships with each other and with the Lord would be established. It’s a classic instance of an Old Testament restoration oracle. Washington uses it in a more everyday sense. He doesn’t refer to Kingdom Come; he just wants to go home to Mt. Vernon and stay there, away from the stresses of military command or political office. Lillback catches the Micah reference, but equally important here is the way Washington uses it to express the Cincinnatus ideal of the savior of the nation who hangs up his sword and heads back to the farm when his job is done. I’m not denying that Washington got the image from the Bible. In fact, I’m quite certain that this is a conscious invocation of Scripture. I don’t, however, think there’s anything specifically religious about the invocation. It serves him as a figure of speech as much as anything else, and in this respect he’s not at all unusual. I don’t mind telling you that this treatment of Washington’s words seems remarkably cavalier, and even a bit sloppy. How anyone could believe that allusions to such a well-known text as the Bible serve as a reliable indicator of personal faith is entirely beyond me. If Lillback ever decides to take a crack at Lincoln, that other famous American who never made a formal profession of faith but nevertheless steeped his words in Scripture, he’ll have a field day. There’s a considerable amount of irony to all this. Lillback has tried to use Washington’s use of the Bible to build up his case that he was a Christian, and he’s become an intellectual darling of those who argue that the Bible played a critical role in America’s founding era. I think there’s a sense in which Lillback has unintentionally understated the Bible’s prominent place in early America. He has assumed that since Washington quoted it, he must have had the same relationship to it that all orthodox Christians share. The truth is probably even more remarkable. The Bible was ingrained so deeply in the American mind that even a nominal churchgoer like Washington, whose Christian faith was and is a matter of dispute, was culturally hardwired to sprinkle it liberally throughout his writings. If Lillback wants to make the case for a Christian America, he might more profitably explain why a guy like Washington could quote Micah in his letters and assume that his correspondents would catch the reference, as they undoubtedly did. Whether or not he was a Christian, he lived in a young nation that had already steeped in the Bible for so long that it was virtually saturated in it. 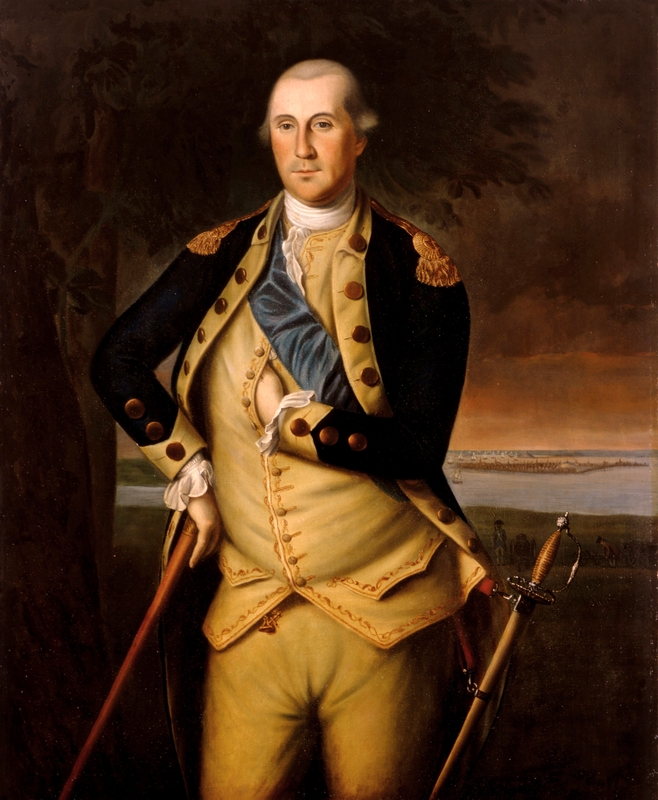 Did George Washington believe in original sin? Since each copy of Peter Lillback’s book George Washington’s Sacred Fire is about the same size as a Kenmore refrigerator, I haven’t read the entire thing. What I have read has left me unimpressed, particularly the section on Washington’s relationship with the Bible. It seems to me that this material contains very basic errors in interpretation. Lillback reads far too much into the evidence he cites. To borrow a couple of terms from Biblical studies, what we have in Lillback’s book is not exegesis of Washington’s writings, but eisegesis. Whereas the exegete finds the meaning in the text and interprets it, eisegesis is reading one’s own viewpoint into the text. Lillback’s book bristles with excerpts from Washington’s writings, but he finds meanings in those excerpts that aren’t really there. To take an example, Lillback flatly states that “George Washington believed in the biblical doctrine of original sin.” Now, when we’re talking about the doctrine of original sin, we’re talking about something more than a belief that humans are fallible or even thoroughly evil. The doctrine is not just a belief about human nature, but a theological explanation of why humans are they way they are. “Original sin” refers to the corruption of humanity resulting from the Fall of Man in Eden. Various theologians have formulated the concept in different ways. Some argue that humans are totally depraved as a result of primordial sin, while others that the Fall merely gave humans a propensity to sin. Some believe that mankind inherited Adam’s guilt as well as his sinful nature, while others hold that his descendants merely inherited his tendency to do evil. But in all these cases, the doctrine of original sin involves an explanation of human nature that relies somehow on the primordial transgression in the Garden of Eden. To believe that mankind is flawed or evil is neither specifically Christian nor religious. A belief in original sin is not merely a belief in human depravity, but a belief about the reason for it. I observe what you say in your Letter of the 2d. Instt. respecting specting [sic] the measurement of Marshalls land. I have already, in a letter about the last of November, given you full directions on this head, and in the one from Elizabethtown desired you to fix the quantity at 500 Acres, to save trouble; but to get it lower if you can, as, from Memory, I think the number of Acres less than that; but could tell almost to a certainty if I could have recourse to my Papers; however, I again repeat, that I had rather fix it at that quantity than let the matter lie open, or run the hazard of disputing with him about bounds. In short, than to delay a moment; for as I have mentioned to you in some former letters, I shall not be in the least surprized to hear that he has hit upon some expedient (if in consequence of his Sale he has not made purchases wch. he may be equally desirous of fulfiling) to get off his bargain with you; for when he comes to find that a barrel of Corn which usually sold for 10/ well now fetch £ 5 and so with respect to other Articles, he will soon discover that the great (nominal) price which he got for his land, is, in fact, nothing, comparitively speaking; for by the simple rule of preportion, he ought to have got £ 20 at least; as I would, in the best times of money, have given him 50/. or more for his land by the Acre. but this under the rose. We need not open his, or the eyes of others to these matters, if they do not already see them. This leads me to say, that I am afraid Jack Custis, in spite of all the admonition and advice I gave him against selling faster than he bought, is making a ruinous hand of his Estate; and if he has not closed his bargains beyond the possibility of a caval, I shall not be much surprized to hear of his having trouble with the Alexanders; notwithstanding your opinion of Bobs disposition to fulfil engagements. Jack will have made a delightful hand of it, should the money continue to depreciate as it has lately done, having Sold his own land in a manner for a Song, and be flung in his purchases of the Alexanders. If this should be the case, it will be only adding to the many proofs we dayly see of the folly of leaving bargains unbound by solemn covenants. I see so many instances of the rascallity of Mankind, that I am almost out of conceit of my own species; and am convinced that the only way to make men honest, is to prevent their being otherwise, by tying them firmly to the accomplishmt. of their contracts. 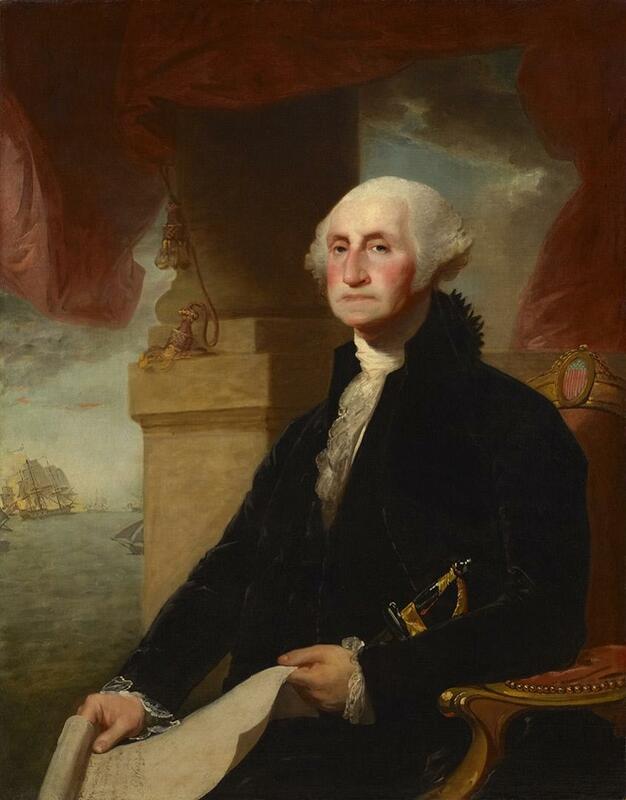 Washington’s aim here was not to issue a decree about human depravity, but to remind his recipient how important it was to lock down business transactions with solid agreements. Still, whatever the context, Washington is undeniably expressing an extremely pessimistic appraisal of human nature. What he is not doing is appealing to the doctrine of original sin in order to account for it. He doesn’t mention a primordial Fall or inherited depravity. He simply states that you can’t trust people, and that when you’re doing business with them you have to take that fact into account. At first glance, this quote is a little more tantalizing. Washington even uses the term “depravity,” with all its connotations of Calvinist anthropology. But once again, this statement that human nature is deeply flawed does not invoke any specifically Christian explanations for why it is flawed. Nowhere does Washington connect his belief in human corruption to the original act of sin in the Garden of Eden. He merely states that the corruption exists. In other words, a man will try to hide his wrongdoing to preserve his reputation, but when that’s no longer a factor, “when character is no more,” the only thing that will make him think twice is “the Law, and the punishments it inflicts.” All this is textbook thinking for a Revolutionary officer. You can find similar sentiments about the importance of reputation in the letters of countless eighteenth-century aspiring gentlemen. Once again, there is nothing in the passage that specifically relates to the doctrine of original sin. What we have is another observation about human nature with no reference to a primordial Fall or a specifically inherited propensity for evil. In short, I think that in his attempt to paint Washington as a believer in original sin, Lillback is leaning on a very thin reed. He convincingly and correctly demonstrates that Washington believed in human depravity—but we’ve known this about him for quite some time. Lillback never ties these remarks to the specific theological assumptions that the doctrine of original sin demands. By this measure, anyone who placed little stock in mankind could theoretically qualify as a believer in original sin, whether he believed in the Edenic Fall or not. A disillusionment with mankind is an important corollary of a belief in original sin, but they’re not the same thing. Of course, we can find numerous instances in Washington’s writings where there are clear and unmistakable references to Biblical passages. In a future installment we’ll have a look at the way Lillback handles these references. Out of Philadelphia comes a news story so bass-ackwards that it belongs in The Onion. Dimitri Rotov has the details over at Civil War Memory. The Olympia, veteran vessel of the Spanish-American and First World Wars and the oldest steel warship still sitting on top of the water anywhere in the world, is at the Independence Seaport Museum. 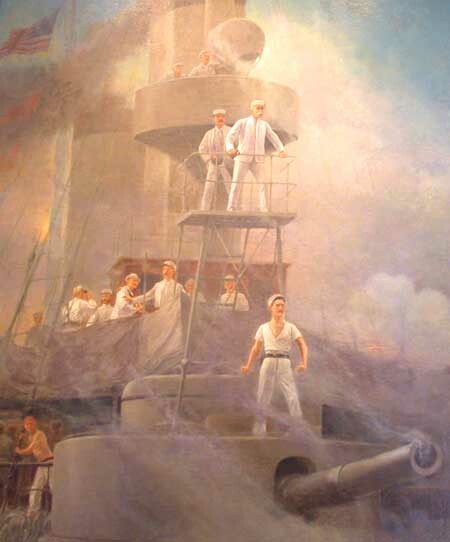 The Olympia was Dewey’s flagship at Manila Bay; he was standing on her decks when he gave the order, “You may fire when ready, Gridley.” She also happens to be the ship that brought home the remains of America’s WWI unknown soldier. Now, the ideal culmination of any effort to locate and preserve some historic vessel is to raise the wreck, conserve it in a lab, and then put in on display where you can interpret it for the public. Olympia never went to the bottom of the ocean. She sailed home to acclaim and ended up as a museum. No sinking, no salvage. So far so good. “Reefing” basically means towing it out to sea and then sending it down to Davy Jones’s locker, where it would be inaccessible to everybody except for scuba divers and fish, subject to the very same kind of deterioration that’s causing the Monitor and the Titanic to crumble to pieces. I’m not trying to criticize the museum. Lots of museums are in a bind. If they don’t have the funds, then they don’t have the funds, and scrapping the ship wouldn’t do anybody any more benefit than reefing it. But the irony here is just absolutely sickening. We spend millions of dollars and thousands of hours trying to raise historic ships from the bottom of the sea, get them afloat, and turn them into exhibits, and now here we have a historic ship that’s already afloat and on exhibit, and it might end up at the bottom of the sea. Unbelievable. There is, fortunately, a group of people dedicated to keeping Olympia afloat, and I urge you to visit their website. Please consider a donation to this organization, or at least sign their online petition.